Don’t take any risks with your hair! We do a full comprehensive Chemical consultation before you book your appointment. This is a complimentary service. We assess your hair needs and the health and strength of your hair. This way you can be sure that your hair is in the best possible condition before undergoing the chemical service to ensure that you get the best result. You should be completely informed and comfortable before making your decision to proceed. The results achieved with Matrix Professional Opti. Smooth System are immediate. The hair is renewed, revitalized for a softer, smoother, shinier result. Opti. Smooth permanent straightening system can be used on any hair type, including hair that has been bleached, coloured or chemically relaxed, along with African/American, hair safely and effectively with the right training. 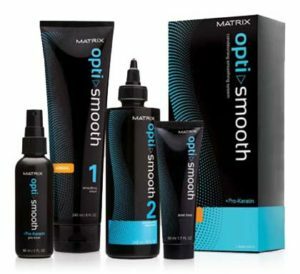 Cold process: Reduces volume, eliminates frizz and smoothes unruly curls. Heat process: With straightening iron- completely straightens hair.